Medium Galvanised Tube. Screwed & Socketed. EN10255 (BS1387). Supplied as 2 x 3 meter lengths unless stated otherwise. 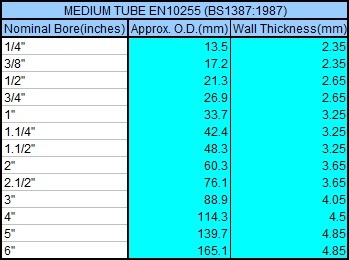 Due to the extreme weight of this tube we reserve the right to alter delivery prices, or refuse delivery as applicable. We also operate a policy when delivering such items to residential addresses that while we are responsible for delivery, the recipient is responsible for the safe unloading and storage of goods.